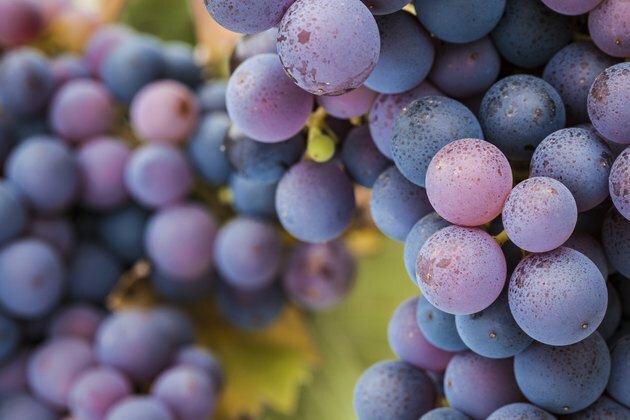 According to winepros.org, the pinot noir grape is one of the oldest varieties to be used for making red wine. It is a popular red, but it has a reputation for being difficult to grow. Pinot noir is a type of red wine. The grapes that make up this wine are grown all over the world, mostly in cooler regions, but the grape is most often associated with the Burgundy region of France. A typical red wine pour is 5 ounces. Pinot noir red wines average 121 calories per serving. Approximately 11 percent of these calories come from carbohydrates, and 1 percent come from fat. The remaining 88 percent of the calories come from alcohol. Each winery produces the same grape variety differently, so a pinot noir red wine has a varying taste across brands. A specific brand may have a slightly different calorie count, depending on its specific sugar and alcohol content.